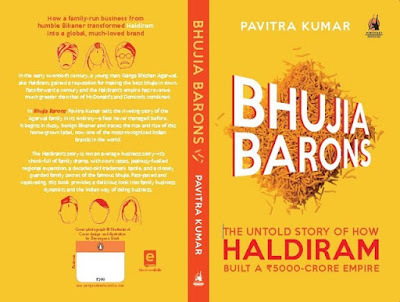 BHUJIA BARONS - The Untold Story of How Haldiram Built a 5000 Crore Empire by Pavitra Kumar (2016), Penguin Portfolio, p 256. It was sometime in February 2017 that I read about Haldiram becoming India's biggest snack maker with a turnover of over 4000 crore leaving aside Nestle Maggi, Domino's, McDonalds and many others. 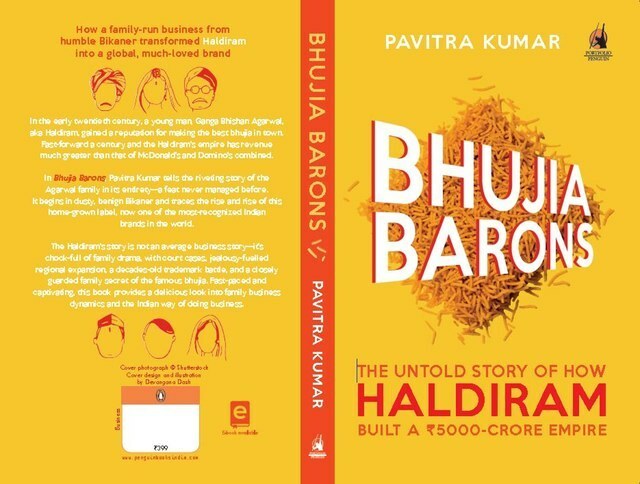 That was the time I wanted to read the genesis and evolution of this great Indian brand and that is when I came across this title - Bhujia Barons by Pavitra Kumar. The book got into my Kindle and has been waiting for its turn. Last week I started reading it and finished it in few long sittings. I must admire the ability of strong story telling style of Pavitra Kumar. She has been excellent in putting through this piece; her style of writing is literatic and engaging and at some places philosophical. Gathering information from different sources and validating it with the people involved in the process at different locations from Bikaner to Kolkata and from Nagpur to Delhi, she has shown impeccable commitment and has successfully put all the views from different corners. Her sense of professionalism in telling all sides and shades of the story without any bias has made this title worth reading. Rome was not built in a day and so was Haldiram brand. Haldiram as we see today is result of efforts put up by people at hand for around 75 years. I have no hesitation in saying that it is the hard work of Ganga Bishen Agrawal aka Haldiram and his concern for customer service, knack for good taste, and belief in strong value system that has made this empire that we see today and which many of their tribe envy. A product that was once sold in newspaper cones, the process which was designed by Haldiram himself through a calculated mix of besan and moth dal sieving through handmade holes on a thin steel sheet, distribution mostly through shopfloor selling, and publicity mostly through word-of-mouth, some 70 years back has traveled a long distance in order to become a household name when it comes to bhujia. It would be no exaggeration to say that bhujia and Haldiram can never be separated from each other. Such is the power of the brand Haldiram. The book provides a rich narrative of making of the brand Haldiram and traces its sound as well as weak links through the family feud, writings of media reports, comparing attitude and behavior of siblings and treatment by their parents and children. Ambition and apathy, respect and reactions, indulgences and impunities, are all have been part of the growing of Bhujia Barons as Pavitra calls them. In the time when the government is emphasizing on Make-in-India through its policy framework, I think Haldiram’s make a strong case of backing that as apart from responding to the locale, they have spread their wings in other parts of the globe as well. They are promoting Indian taste to the people abroad whether they form part of Indian diaspora or otherwise. The expansion of this brand from merely a bhujia maker to branded, formalized structure of sweet shops and retail chain of vegetarian restaurants or QSRs (Quick Service Restaurants), responding to all kinds of tastes is the strength that the promoters have built through their concerted efforts at different geographies in India. Till their entry to Delhi, the capital city of India, it seems there were not much issues related to the use of brand among the cousins. But as they say, Delhi has a strong division power, when brothers Shiv Kishen (Nagpur) and Manoharlal (Bikaner) [grandsons of Haldiram] plunged into exploring the opportunity in Delhi. This territorial expansion also lured their cousins who were operating out of Kolkata which has brought the families to court for settling issues over use of brand. Though there seems to be some sky-clearing, yet the matter is not fully resolved and the families are not in that kind of relation as used to be. Pavitra has explicitly narrated the aftermath of Indira Gandhi’s death on 31st Oct 1984 and its effect on Chandni Chowk workshop of Haldirams and that is how the book starts which I thought makes a good plot to a storyteller who weaves together the threads back and forth and serves a tapestry of family run business model. For a moment I got nostalgic about my college days when we had heard of assassination of the prime minister of India by her own security personnel. The whole story of Haldiram as narrated by the author makes me feel as if I am watching a Bollywood Hindi masala movie which portrays almost all kinds of moods and emotions, climax and a happy ending. Today who does not know about Haldiram Bhujia, but very few know about their resilient journey. This book provides a good account of that journey. The book is divided in Six parts starting with introduction and family background, their movement to different places and the wrongdoings of Kolkata cousin (the black sheep), legal fights and the future ahead (final paces). It is a revelatory tale of a family business house which has built a reliable brand over the years. The author deserves appreciation for an excellent display of honest effort, professionalism and probity through this work. And I can't stop myself from saluting the spirit of great entrepreneurship, innovation and customer service as envisioned and portrayed by Ganga Bishen Agrawal. What a man he was. There is lot to learn from him for the entrepreneurs of today and tomorrow.